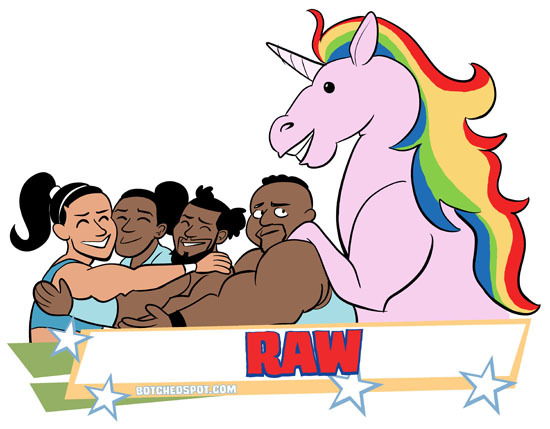 I think Raw was the clear standout this week, with Kevin Owens winning the Universal Championship and Bayley and New Day forming the most positively positive team up of all time! Seriously, Bayley and New Day can team every week for all I care, the two meshed perfectly. Since the draft, WWE seems to be more comfortable having the men and women superstars interact acknowledge each other’s existence beyond the manager/valet level, and it adds a lot more depth to the show. The main event and all the build up to it was also great, and by the time the opening bell rang I honestly didn’t know who would win. As I mentioned in my Wednesday comic blog, I wasn’t trilled about Triple H’s involvement because Owens didn’t win due to being stronger, smarter, sneakier, or more ruthless than the other men, he just pissed Triple H off the least. I’m still looking forward to next week though so I can hear what the explanation for everything is. I really liked seeing Shinsuke Nakamura by himself in the ring this week talking about what the NXT title meant to him. He may need a translator when he gets called up (I’m dreading the “what” chants), but in front of a passionate, respectful crowd it was great to hear him talk in his own eccentric style. I also really loved the Revival’s segment and I’m looking forward to seeing who their next opponents are. Those two are some of the only heels in WWE that manage to be good wrestlers while getting boo’d, which isn’t an easy feat in this day and age. The rest of NXT was also a good showcase for NXT’s younger batch of wrestlers, who are trying very hard to fill the shoes of all the big names who just left. Lots of things happened on Impact Wrestling this week, but all I can think of now is “Final Deletion Part Two” is next week! “Delete or Decay” as it’s being called. It’s kind of weird to see Matt turn into the babyface in this feud, especially when Brother Nero is only with him because Matt “broke” his spirit or sanity, but the Hardys are undoubtedly the most entertaining part of the show. I think Maria’s title win should have been a huge deal, but it felt very flat to me. I felt bad for Allie, but it wasn’t like she worked really hard to get the title (in character, of course) so seeing Maria get a cheap victory over someone else who won it with a cheap victory just felt meaningless. It doesn’t help that we’ve seen so many new Knockouts champions recently. I loved Smackdown last week, but it kind of took a turn for the worse this time around! It wasn’t bad, but after that bombshell of a “Talking Smack” episode last week, I was disappointed to see it culminate in a Miz vs. Dolph match and Bryan using it to needle Shane about Lesnar. Rhyno drawing faces on his crackers at the Slater Family Compound was easily the highlight of the show, which tells you just about everything you need to know!